Tax season has arrived in Canada. For some, it's a time to celebrate how much they'll receive on their returns. For others, it's time to complain about how much they have to pay to the government. Sure, it's frustrating to have to cut a cheque to the feds. But as a new report shows, it's much, much worse in other countries. The OECD issued its "Taxing Wages 2016" report on Wednesday. It aims to show how much personal income tax and employee contributions people make in 34 countries. The report measures a tax burden by calculating a "tax wedge": total taxes that people pay, minus family benefits. Tax wedges were calculated in various ways, such as how much you pay when you're single, or whether you're a couple with two children. And as this graph shows, Canadians among the lowest of the low when it comes to the total tax burden. Scroll over the bars to see the tax wedge in various countries. The tax wedge for Canadian couples with children was 18.8 per cent, seventh-lowest among all OECD countries. Countries with higher tax wedges were mostly concentrated in Europe. Topping the list for couples with kids was France, at 40.5 per cent, followed by Belgium (40.4 per cent), Italy (39.9 per cent), Finland (39.3 per cent) and Austria (39 per cent). Meanwhile, Canada's tax wedge for single people ranked 10th from the bottom, at 31.6 per cent. Here, too, European countries dominated the top ranks. Canada did, however, rank higher when it came to income taxes. It came 13th in income taxes on couples with children and 14th for single people. Denmark was far and away the highest when it came to income taxes, at 31.9 per cent for couples with children and 35.8 per cent for singles. The report comes months after the federal government reduced taxes on middle-income earners ($45,282 to $90,563) from 22 per cent to 20.5 per cent. The new rate came into effect on Jan. 1. 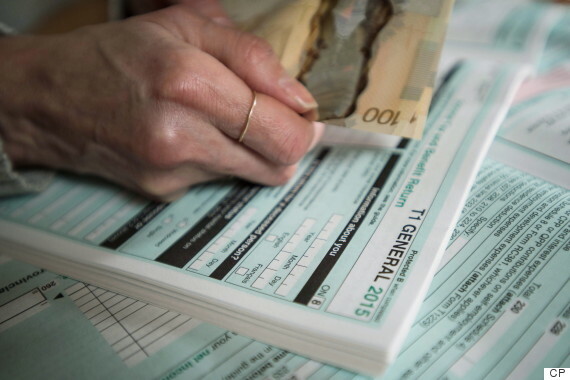 Canadians have until April 30 to file their taxes, but the Canada Revenue Agency is also allowing people to submit their forms by May 2.